Xbox One won't stretch DVD to fill widescreen TV? How to change aspect ratio from 4:3 to 16:9 or vice versa and get letterbox off? "Can't play Xbox One DVDs in FULL SCREEN. When I play a DVD, I get the letterbox either side of the screen. Basically the picture has a black border each side. Now with the same DVD, the PS4 I just changed a setting pressing the options button. But on Xbox One I can't seem to find the setting to change aspect ratio 4:3 to 16:9. Can anyone help me please?" The latest complaint about "Xbox One DVDs don't play in full screen" was filed by users in June 2017 in official Xbox forum. Honestly, this issue has always been there ever since its release in 2013. And no, it's not fixed yet, which kind of drives users, who hate letterbox, crazy. They just wonder why a console costing about $500 cannot play a DVD in widescreen. It doesn't even have an option to change the aspect ratio. The even more ridiculous thing to the users is that even Xbox 360 allows stretching DVD content from 4:3 to 16:9. Being an updated version, how could Xbox one not support such a basic necessity for entertainment? Do you have to manually remove black bars? We have been thinking up several tricks for removing black bars and play Xbox one DVD in full screen on TV. But it will be more understandable to first learn some basic information. This article is not only for Xbox One users, but also for all of you who want to change aspect ratio. Why Won't Xbox One Stretch 4:3 DVD to Fill 16:9 Widescreen TV? From its official page about TV resolution and Xbox One you can see that 480p (4:3) is supported by Xbox One but is not recommended. It clearly states that there will be black bars on the left and right sides. But how could it be? We'll start with the different aspect ratio settings of DVD/Blu-ray and TV. What Is Standard Aspect Ratio of DVD Video and HDTV? 1. Before converting aspect ratio from 4:3 to 16:9, you should know that almost all of today's HDTVs are widescreen in 16:9 aspect ratio (1.78:1), while old fashioned SD TVs normally are 4:3 (1.33:1). 2. But most movies are projected in 2.35:1 or 2.40:1 nowadays. It used to be 4:3, which is mainly used for 35 mm films, however phased out for being too narrow. Then 1.85:1 became popular. DVDs marked with 1.85:1 (16.65:9) suits your TV most in full screen with least black bars. 3. 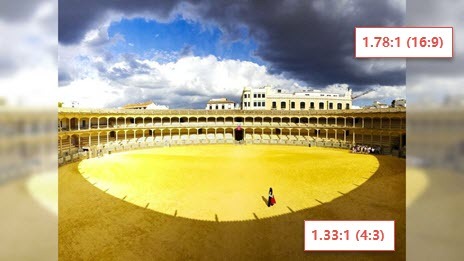 Generally speaking, all Blu-ray discs should be fully played in 16:9 widescreen TV, with no black borders issues and no trouble of aspect ratio changing between 16:9 and 4:3. 4. DVD resolution varies among 720×480, 720×576, 704×576, 704× 80, etc. So how do you know whether it can be played in full screen in TV without black bars through Xbox One or any other players? Just look the back cover of your DVD. The aspect ratio is in the DVD specification part. If it's "Widescreen 1.85:1", then insert it into Xbox one, connect Xbox one to your HDTV, and it will play in full screen with nearly no black screen. When Can You Play Xbox One DVD in Full Screen without Black Bars? 1. Xbox one DVD in full screen can be realized only if you are playing a video in the same aspect ratio with your TV display. So play 16:9 DVDs on 1920x1080 widescreen TVs: Ant-Man and the Avengers in 1:78.1/1:85.1, to name a few. And play 4:3 DVDs on, for example, a 1440x1080 TV. As for DVD movies in 2.35:1 or 2.40:1, there is no perfectly effective way to play in full screen on 16:9 TV without black bars or a certain degree of image distortion. 2. There is still another possibility for your "Xbox One DVDs don't play in widescreen". When you play two DVDs both in 1.85:1 through Xbox One, one will fill the full screen while another cannot. Why? Actually, the movie itself might be natively made with black bars for better playing on widescreen. Use any player to open your DVD on PC, do not enlarge the player box, and then you will find out if it comes with black bars natively. Why Do People Like to Play Xbox One 4:3 DVD on 16:9 TV? "I have my Xbox set up with the original HDTV adapter, on the dash I have it to widescreen and tuned on 480P, 720P as well as 1080i, but the 4:3 games do not switch from 16:9 automatically. Is this normal or am I misremembering how this works?" Well, it is not that people like to play 4:3 DVD on 16:9 TV and then try to make it full screen. They just have no option sometimes. 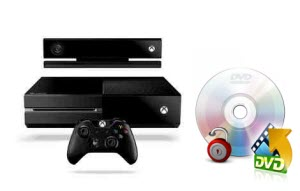 Some of them may have plenty of old film DVDs, while some others don't mean to use Xbox One for DVD playback. But the DVD player may act up every now and then. Besides, there are games that only support 4:3. And some people are still using 4:3 SD TVs. How to Stretch Xbox One 4:3 DVD to 16:9 in Full Screen? 1. Try to change TV settings, maybe the aspect ratio (from 16:9 to 4:3), the resolution, or the option like from normal to wide. But note that it probably distorts the videos. You can adjust the resolution of your PC in "Display settings" and then see the effect on the desktop buttons. 2. Update your Xbox One BluRay app. According to some users, DVD would fill the widescreen with the app updated. 3. You can try "zoom" or "magnify" option on your TV, which however is not recommended here. The image should become fuzzy. 4. You can remove black bars or change video aspect ratio from 4:3 to 16:9 by using DVD ripper software. But you should only do this when there is little difference between the real image aspect ratio and 16:9. And it would be better to decode a few of the frames to check the real image aspect ratio first. Actually, no media player can stretch 4:3 to 16:9 with no black borders and no distorted image. If you directly change aspect ratio to 16:9, all slim bodies become a little bit or very fat. If you scale up the video, then there must be a loss of scenes. 1. You are watching a 16:9 DVD video on a 4:3 SD TV screen if you see bars at the top and bottom of the screen. 2. You are watching a 4:3 DVD on a 16:9 HDTV screen if you see bars at the sides of the screen. To make you more clear about the effect (size of black borders) of videos in different aspect ratio on a widescreen HDTV (16:9), we made the next table. Apparently, you will be left with black bars on the top and the bottom in all cases, except for the playbak of 4:3 DVD. Remove black borders, change aspect ratio, adjust bitrate, trim video, etc. Rip any copy protected DVD to MP4, AVI, WMV, MPEG, MOV, etc safely. Convert DVD for playback on Windows (10), Mac, Xbox, iPhone, Android, etc. Clone DVD to ISO image or DVD folder at 1:1 ratio for later burning. DVD not playing full screen on TV, Xbox, PS3/4 etc.? How to make a DVD to fit on any screen and remove black bars from DVD without loss? Get available solutions here. [Solved] Xbox One Won't Read DVD Disc? How do you fix if your Xbox One or One S won't read, recognize or play DVD discs? See this quick and simple guide on all the Xbox One not reading disc problems on Windows 10. This post focuses on showing you how to repair Xbox One disk drive errors by yourself, such as Xbox One not reading disk, Xbox One disc drive makes grinding noise.